There’s no better time to get flirty than on Valentine’s Day -- especially when it comes to your hair and makeup. Soft waves, dewy skin and rosy cheeks create a dreamy, romantic look that’s perfect for the evening, whether you’re planning a big night out or intimate dinner at home. Try the following tips for makeup application to score a look you’re both sure to love. You can’t go wrong with loose, bohemian waves. Start by working volumizing mousse onto damp hair and blow-drying completely. (If you’re short on time, sprinkle dry shampoo, such as Oscar Blandi Pronto Dry Shampoo, on your roots.) Wrap small sections of your hair around a curling iron, only using the middle part of your strands; keep the iron away from your roots and ends. Repeat until you’ve curled all of your hair, then gently brush out and set with hair spray. Want to wear your hair up? Show off your neck and shoulders with with a romantically undone ‘do. First, curl dry, unwashed hair with a large-barrel curling iron. Then pull your hair into a loose ponytail at the nape of your neck or to one side, and secure with an elastic band. Twist hair around the band until it forms and bun and secure with bobby pins. Run your fingers through your hair for some wispy face-framing pieces and finish off with hairspray. For an extra touch, add a pretty headband. To achieve a gorgeous glow, skip heavy cream-based foundations. Instead, lighten up your look with an illuminating sheer liquid foundation, such as Stila’s Illuminating Liquid Foundation. Then dab on the concealer only where needed, and set with a translucent powder. To remove excess product, blot with a facial tissue. 3. Try a twist on the smoky eye. Trade in your usual black or charcoal eyeliner for a pop of color, like emerald green, deep plum or navy blue. To apply, smudge the eyeliner along the top and bottom of your lashes; you want an uneven, soft look. Wrap your forefinger in a facial tissue, and swipe away any excess beneath or in the inner corner of your eye. For an extra pop, dab a little white eye shadow in the inner corner of your eye or add a subtle gold liner just above the top lash line (apply on top of the colored liner). Keep the rest of your makeup neutral -- and all eyes will be on you! 4. Look pretty in pink. In the beauty world, going match-matchy is usually a don’t. But the romantic look is an exception to this rule: Soft pink lips and cheeks create a super-dreamy appearance. To avoid going overboard, apply the blush only to the apples of your cheek. Then add a touch of bronzer along the edges of your face: On each side of your forehead, a sideways “W” motion from the edge of your forehead to the cheekbone, and then from your cheekbone to the side of your jawline. 5. Get soft, dewy skin. A simple trick for come-hither skin: Apply moisturizer before and after you put on your makeup. (You heard me right -- after!) Like to a topcoat of nail polish, lotion sets your look and adds a little glow. Pat, don’t rub, a little drop of moisturizer on your cheekbones, T-zone and chin -- and you’ll look gorgeous all evening. Get more by following us @FaceEveryDay or friending us on Facebook at Beauty & Confidence. Many beauty product trends come and go. (Remember hair crimpers and shampoo-plus-conditioners?) But each year, cosmetic companies release some technologies that can help make your life easier -- and make you look even more beautiful. Here are six of my favorite beauty breakthroughs to help keep you gorgeous all year long. This magic potion is a one-stop-shop for all skin types and tones: It acts as a serum, moisturizer, light foundation and sunblock all in one. Apply to clean skin, or under your foundation if you need extra coverage. A little of this cream goes a long way; simply dab off the excess with a facial tissue. There are a number of brands, which range in price, but I’ve found they’re all created equal. I’m not talking about your mama’s hot oil treatment! From Moroccan to shea nut butter to argon, these silky serums transform your tresses from dull and damaged to smooth and silk. Made from essential and natural plant extracts, these oils tame fly-aways, add shine and prevent breakage. To use, apply a few drops to wet or dry hair. You can also dab a little on dry cuticles and ashy elbows! You’ll basically die and go to Angelina Jolie lip heaven with these volumizing lip polishes. These super-shiny glosses are made with ingredients that stimulate lip collagen, resulting in a fuller pout. Use alone or over lipstick, and blot away excess with a facial tissue. I recommend testing before investing, since some can tingle…and not in a good way. Let’s take a moment to raise a glass and say grazie to the geniuses who dreamed up these root cover-up products. Whether in a spray, powder, or mascara form, these concealers help cover grays between trips to the salon. They’re also available in fun shades, such as purple, so you can add a pop of color to your mane. Look for brands that are free of sulfates and parabens, such as Rita Hazan’s Pop Color Spray. Now there’s no excuse for barely-there brows! These brow kits contain all you need to shape your own brows. First, tweeze away stray hairs. Then use the angled brush to apply brow powders, following the natural shape. Lastly, set with a little wax to keep hairs from straying. Creased eye shadow is so 2012. This lightweight cream helps keep eye makeup flawless from day to night. Apply the primer as a base beneath your shadow for longer-lasting color; apply just enough to cover your entire lid. You can also use it on its own as an eye-brightener. My pick: one with a shimmer effect like Too Faced Shadow Insurance in Candlelight. Finish the look with a little eyeliner, and you’re good to go! Most women spend a lot of time and money picking out the perfect lotions, potions and makeup for their skin. But without the proper application, even the highest-quality products won’t do much for your appearance. That’s why it’s important to have the right tools. The correct sponge, for instance, can turn streaky foundation into an even, natural glow, while facial tissues can help lipstick stay put. As a makeup artist, I handle hundreds of beauty items on a regular basis. Here are the six I swear by, plus simple tips for makeup application. 1. Spoolie brush. The quickest way to look put-together is by grooming your brows. A spoolie brush, which resembles an overgrown mascara wand, can put those hairs in their place. Sweep it upwards and outwards; then trim any errant brows with a pair of small scissors. Finish the look by filling in any gaps or sparse areas with an angled brush dipped in brow shadow. 2. Latex-free sponges. There are many ways of applying foundation: I like using a synthetic brush on my client’s faces. But, no matter what method you prefer, it’s smart to follow up with a sponge. Holding the skinny side of the wedge, tap the flat, square side in circles over the entire face. This dabbing motion blends the product while pushing it into the skin. It also absorbs any extra foundation, which prevents a streaky or caked-on look. It’s my secret for an even complexion. 3. Facial tissues: This simple product is a makeup multitasker. I use it as a blotting paper to soak up excess product and oil, and also to set lipstick. Dipped in a makeup remover, a facial tissue also works to erase errant makeup for quick touch-ups. I also like to wash my brushes and lay them flat to dry overnight on several facial tissues. Dirty brushes spread bacteria, and product buildup can break the bristles. If you’re too busy to shampoo your brushes, spritz a tissue with a brush-specific cleaner and wipe each one thoroughly. 4. Eyelash curler: Curled lashes make eyes pop in seconds. But most women use curlers incorrectly: You’re supposed to slide the clamp gently up and out, not just bite down on your lashes with it. That’s why I recommend a heated eyelash curler for beginners. This device is like a small curling iron for your lashes, although it doesn’t get nearly as hot. Many also feature a comb to help separate and brush through the lashes. To use it, apply a coat of mascara. Then rock the wand at the root of your lashes. Slowly rotate your wrist upwards, sweeping the wand out toward the ends of your lashes. If needed, finish with another coat of mascara. 5. Fan brush. I love shadows with some shimmer, but they often fall from the eyelids onto your cheek. To sweep away any errant shine, I use a small fan-shape brush. My method: First, I swipe a stripe of loose facial powder beneath each to catch any fallen product. After applying the eye makeup, I use the fan brush to sweep away the powder. We’ve all been there: After an important meeting or event, you discover that there’s lipstick on your teeth or mascara beneath your eyes. As a celebrity makeup artist, it’s my job to prevent these embarrassing beauty blunders. After all, my clients step in front of the television camera to face millions of viewers. To avoid the most common missteps, try my foolproof tips for makeup application. And if you happen to slip up while dabbing on eyeliner or another product, I’ve got you covered too. My secret? You don’t have to be perfect to achieve a flawless look! Tip for Makeup Application: Accidentally smear a little on the top of your lid? Instead of immediately wiping it away, cover it up with dark-powdered eye shadow. Blend the shadow across for a smoky eye, and feel free to experiment. If you wind up not liking the results, don’t sweat it. Simply wipe it away using facial tissues with makeup remover or wash it off. Tip for Makeup Application: On any given day, I see at least a few women walking around with an eye shadow crease. This unsightly line occurs when powder settles into the fold of the eye. To keep shadow in its rightful place, first prime your eyes before applying other makeup. Swipe a little concealer or powder onto your eyelid to create a smooth surface. Then blend in the shadow for a long-lasting look. 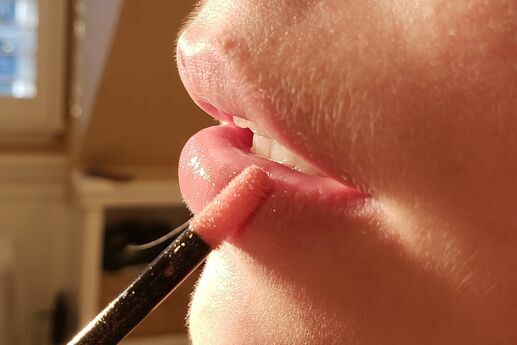 Tip for Makeup Application: You’ve probably heard my tip before, but there’s a reason why it’s been around for years: It really works! After applying a fresh coat, place your index finger into your mouth and slowly remove it. Or if you don’t have time to rinse your hands, take a facial tissue, fold it in half, place between your lips and lightly press down. Either method wipes away any of the excess lipstick on the inside of your mouth; it’s that extra residue that tends to smear onto your pearly whites. Smart Hair Tip: Call it a beauty catch-22: You need to tame those unruly wisps, but you don’t want to weigh down your hairdo with a lot of product. My simple solution? Grab a clean toothbrush. Spray the bristles with a little hairspray, and then lightly run over any flyways. You’ll distribute just the right amount to put those strands in their place. Tip for Makeup Application: Eyeliner can be tricky, but one of the easiest fixes is to use a soft kohl pencil to line the inner rims. You’ll get defined eyes, without having to worry about streaks and smudges. And when applying eyeliner, remember to angle your pencil downward. You’ll get closer to the lash line, which prevents an awkward gap. If you do get a smear, lightly dab with a soft facial tissue to protect your skin while removing excess makeup. Tip for Makeup Application: On hot days, the sweat and humidity can do a number on your foundation. That’s why I like to keep it light in the summer. First, clean your skin with the proper toner and facial tissues. I recommend astringent for oily complexions and witch hazel for people with dry skin. This removes excess oil from the face, which helps makeup stay on longer. Then simply apply tinted moisturizer to even out your skin tone, and add a little cream blush. This look is light and fresh, and it’ll never appear uneven. Always looking good means being prepared -- whether you’re at work, out on the town or just running errands. As a makeup artist, I’ve learned that a little bit can go a long way in giving your face a refreshed and healthy glow. While I can’t carry my giant roller-bag of beauty products with me everywhere I go, I can stash the absolute essentials in my purse. From concealer to facial tissues, here are the seven things I never leave the house without -- along with a few tricks for making them work magic. This device is a great investment because it lasts a long time. (Just replace the pads every three or four months.) It’s also a cinch to use, even for people who aren’t comfortable wearing eye makeup. The payoff: Curled lashes make your eyes look bigger, open and more awake. This is a foolproof way to add some pop to your face and moisturize chapped lips. Go for something glossy with a slight hint of color. Keeping a pack of tissues handy can save you from beauty blunders, like smudged mascara, and help you remove excess lotion or toner. You can also use them to wipe off sweat on a hot day or after a workout. Remember: Using your hands can spread dirt and clog pores, unless you’ve just washed them. It’s important to stay hydrated throughout the day, inside and out. Dab moisturizer -- don’t rub it in -- over dry spots, or spray a little toner on your face, to get a fresh, dewy look. Remove any excess by lightly patting your face with a facial tissue, which is gentle on delicate facial skin. The only way to cover dark circles, red spots and pimples, concealer is my No. 1 one must-have. In my opinion, it’s even more important than foundation. If your makeup job needs freshening up, start here: Apply a tiny bit of concealer on your fingertip and pat under the eye. It will brighten your whole face immediately. This helps set your foundation (if you’re wearing any) and even out skin tone. I like to dab off excess oil with a facial tissue and apply a bit of powder in the midafternoon or evening to freshen up; it helps soak up any oil that has accumulated throughout the day. I always carry one compact with four or five shades of eye shadow, from dark to light. The lighter colors serve as a highlighter when you want to pump up your eyes, while the darkest ones act as eyeliner when you want to go from day to night. If you want to freshen up after lunch or before a big meeting, the first step is to quickly clean off any oil or makeup that has run or melted into the creases around your eyes. Wrap a facial tissue around your index finger so it’s fully covered. Then, starting at the inner corner of each eye, work your finger around the bottom lashes to the outer edge, wiping out any loose or oily residue. Give your top eyelids a quick sweep too. Next, refresh your makeup: Spritz your face with toner or apply moisturizer, add concealer and powder, and re-curl your eyelashes. You can also add a fresh coat of mascara if you have it with you. If you wear lipstick, chances are you’ll need to reapply by midday. Here’s a trick for helping your color stay put and preventing it from bleeding off of your lips: Apply a coat of lipstick like normal, then take a facial tissue and pull it apart so that it’s just one-ply. Put that layer of tissue over your lips, and then over the tissue, dab a little bit of loose powder. The powder’s color won’t leak through the tissue, but it will help your lipstick set. Headed straight to dinner after work? Give yourself a bolder look. The easiest way to do this is to play up your eyes with eyeliner or the darkest shadow in your eye shadow quad compact. With the eye shadow brush, carefully apply the shadow to your waterline, at the base of your bottom lashes. Dampen a facial tissue and quickly sweep under each eye to clean up any excess shadow that’s flaked off, and you’re good to go!